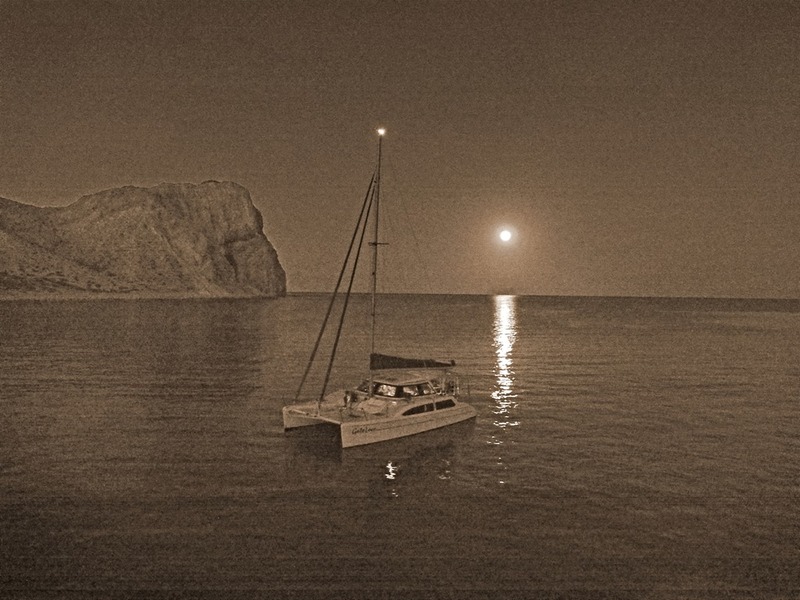 Wanderlust: n. a strong desire for or impulse to wander or travel and explore the world..
Gato Loco’s 16th season sailing the Sea of Cortez will start May 4th. Plans have been a little slow firming up but things are coming together. 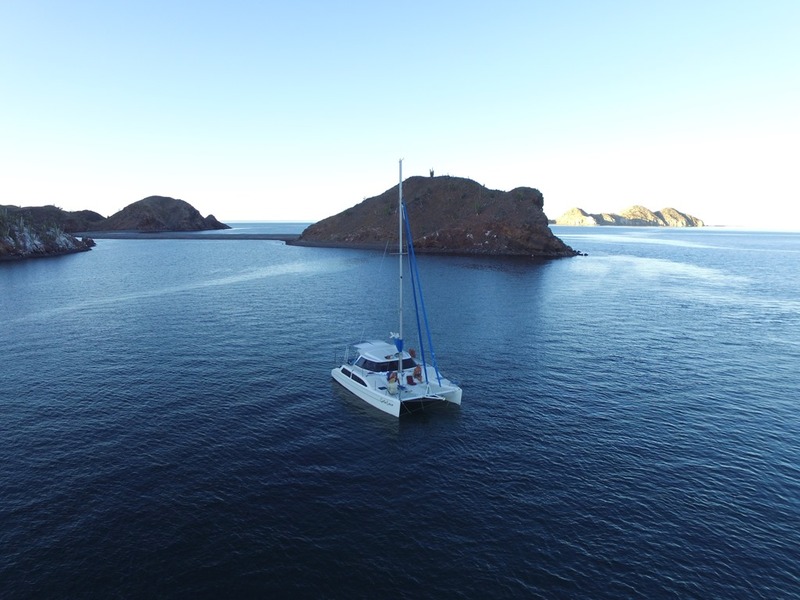 This season we make passage south to Loreto via San Carlos allowing our working crew members to head back north after the week long leg to San Carlos. Co-owner Dave Redden is retiring as our season begins and will be able to spend more time sailing this year. Congratulation to him on his retirement. Leg 2 from San Carlos to Loreto will have co-owners Rick, Dave and I for the first time in years. Bill will be absent this year nursing back problems. In prepping for this year, I’ve looked back at last years introduction to more video content and plan on producing even more this year as I’ve added a drone to my equipment list and working to improve my video skills. It’s a lot of fun for me. Here’s a short video montage from last season. Check it out. There’s extra excitement this year with the developments in Puerto Escondido. The marina was sold by the Mexican government and the new owners have made big changes. Our week long Seawind Rally sponsor West Coast Multihulls AKA Kurt Jerman is opening a charter business in the new marina development so we will be able to better enjoy the marina amenities. He has his first charter boat available, a Fountaine Pajot SABA 50 and is offering cabins for charter for the Rally week for sailors that might want to attend but can’t get their boat to the Sea. Contact Kurt at kurt@westcoastmultihulls.com if you would like to join the week long Rally. Here’s our season schedule starting late this year May 4th. Rally week is May 20-25th. Leg5 June 3 – 10 .. Loreto area (Rick). Leg6 June 10 – 20 .. 7 to10 days home (Lowell, Jeffrey, Lynnie, Space for 1 or 2 people. 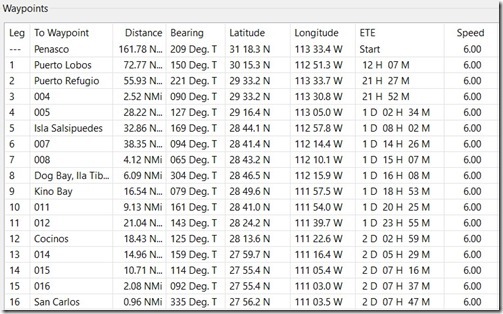 Leg 6 is a pass making leg with some long days of sailing which is not for everyone. We cover Baja Loreto to Penasco. This years Baja Rally is shaping up with 11 boats (so far) joining us for the of sailing adventures in the Loreto area. Kurt will be on his first boat in his charter fleet a Fountaine Pajot SABA 50. This will be our mother ship for the weeks activities. Here’s some thoughts on what the week looks like. 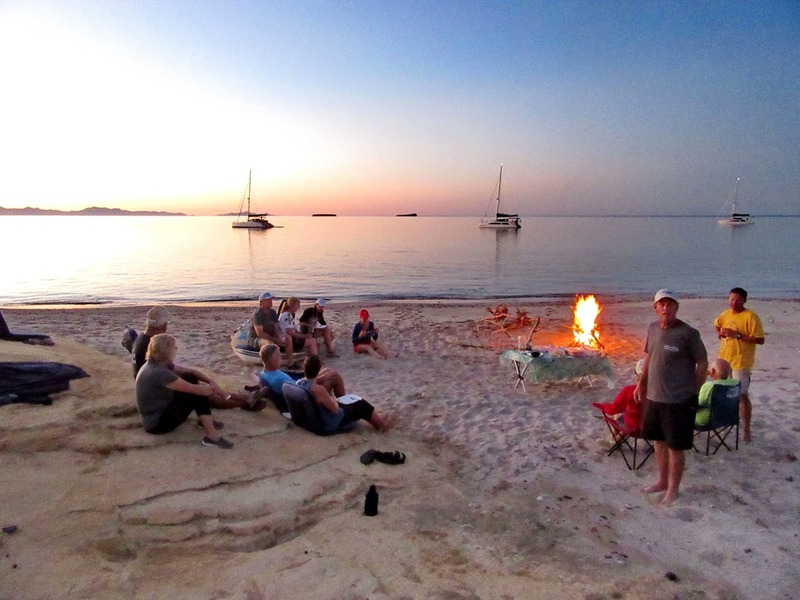 -Spend the next five days tooling around (and racing a bit, just for fun) from one gorgeous anchorage to the next, exploring the fabulous islands in the Loreto/PE area, with a weenie roast one night somewhere and Ralph’s famous French toast breakfast the morning of day 5. -Wrap up at Loreto waterfront (weather permitting), or back at Puerto Escondido on May 25. Here’s a list of boats and captains signed up for the rally at the moment. Some details on our passage south from Penasco to San Carlos. I’ve received questions and and been asked for recommendations on making passage south. Here’s a chart of what we think we will take to San Carlos this year. Why this route? Our usual route south goes through Bay of LA where we pick fuel for our dual 9.9 Yamaha’s. 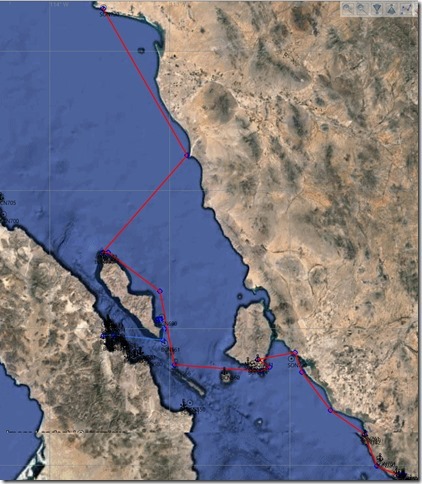 The channel between Baja and Angle island never disappoints for an aggressive sail leg. This year, since we’re heading to San Carlos, we will use Kino Bay for our refuel stop. Obviously we could make the entire trip without a refuel but we tend to motor in the morning waiting for the days solar winds to arrive. If we have weather we could use very little fuel but it best to plan for a refuel. 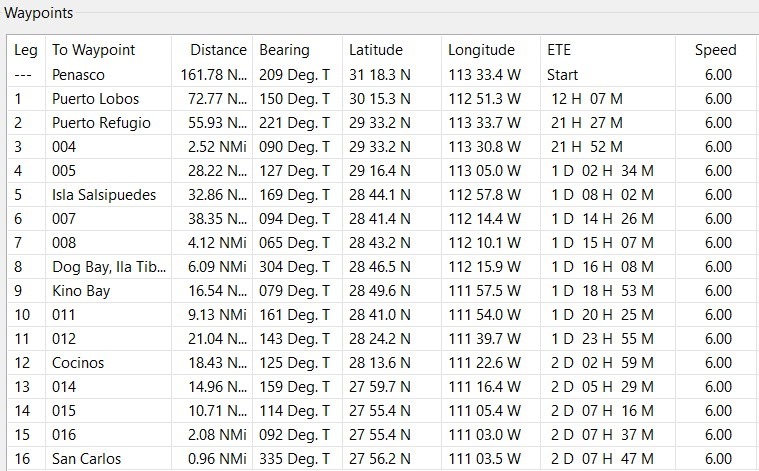 Puerto Lobos is the closest anchorage (73nm) with a typical SW wind provides a good sail south. The 2nd day to Puerto Refugio (56nm) also usually give us good winds and is short enough leg to arrive in Refugio in time to enjoy the area, assuming the boo boos let us relax. This year we will head south east of Angle island to the little island of Salsipuedes (64nm). This is a cool little island that we love to hike and it has both a north and south wind anchorage and our crew have never been there. Day 4 should take us into Kino Bay (60nm) with an option to divert to Dog Bay if sea condition are not good to anchor off Kino. The passage back to the Sonoran coast across the midriff islands usually has a beam reach wind. We can enjoy a dinner onshore and pick up some fuel. Day 5 gives us lots of options with the numerous anchorages north of San Carlos (47nm). The closest is Los Japanese, a small fishing village with a tiny anchorage that only supports 2 boats. Day 6 allow us to grab another anchorage or head on into the San Carlos area. I always enjoy your video’s of your adventures. Thanks Coni, It’s going to be a fun season.